"Discouragement is Fatigue of Motivation"
It’s like the subtle pain that sets in the muscles and joints having just accomplished great feats. It is a common occurrence. The knowledgeable have discovered that just as an athlete feeds his muscles within 30 minutes after a workout, so should an exhausted spirit be "nourished" with encouragement -whether in victory or defeat -at the beginning and towards the end. 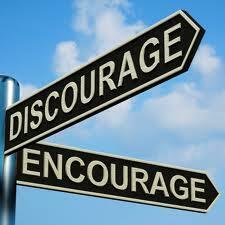 "Encouragement is the Best Nourishment"